This has been along time coming, but as promised here is my thoughts on what I was planning on drinking at GABS. A few of the standouts I can remember but the rest are coming from the notes I took on the day. Section 1 - I thought that overall this was a pretty weak section. The loss of the 8 Wired and Birbecks' change really hurt an already weak section. Special mention to 2 Brothers Creme Caramel which was Lizzie's favourite beer. 8 Wired Rastafari Unchained (NZ) - Unfortunately a late scratching which was disappointing. CUB, Feral and 2 Brothers Land of Plenty Lager - Not amazing, good hops towards the back end. Behemoth ROFLcopter - Not bitter enough, good Belgian yeast characteristics. Bierbecks Kooringa - Changed to Tart-Shaped Box, I was not a fan, it was very woody. Thirsty Crow "& J's" - This was amazing! Tasted exactly like sour jelly. Was even better when combined with Bootleg's PB to make "PB & J". Section 2 - Section 2 was a much better section. My favourite of this lot was the Emperor Nero from Camden Town in the U.K. with the Doctor's Orders a close second. I think how much I'd hyped this up made me a little more disappointed in it than if I knew nothing about it; great to have a 7.5% sour! Bright Battle of the Bulge - Nice "Belgiany" IPA. Not much in the way of hops, definitely yeast driven. Camden Town Emperor Nero - "Roasty hoppy citrusness" - that's actually what my notes say! Doctor's Orders Electrolyte Forte - Not as good as I'd hoped it would be, still a very nice sour. Duckstein Vanilla Bean Framboise - No noticeable vanilla bean, dominated by sour raspberries. 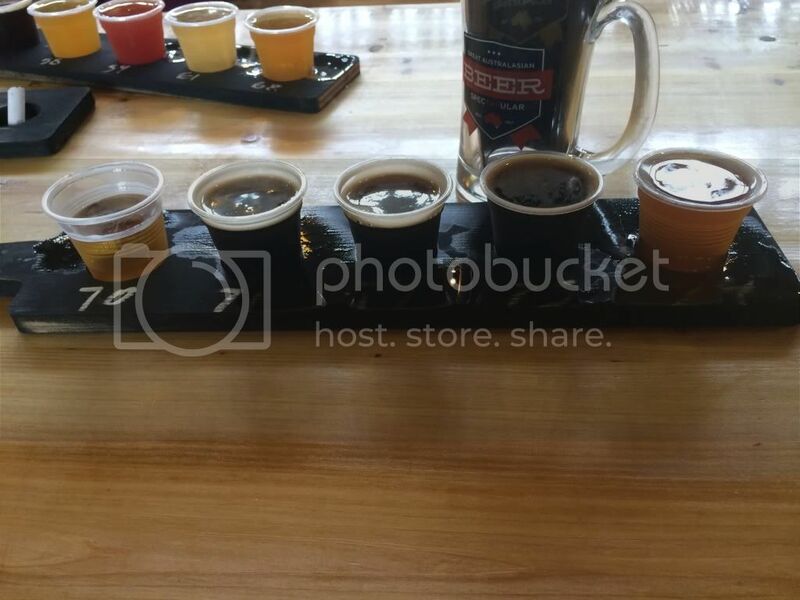 Section 3 - I rated nothing under 4 on Untappd in this section! I think I had 10 or 11 samples here and could have easily had more! Lizzie's favourite was Ekim's Slammer - a tequilla infused pale ale that was very very drinkable! The Garage Project's Umami Monster probably also deserves a mention - as expected from these guys it was weird - but smokey and shroomey; by the end I really enjoyed it. Evil Twin Fitzroy Hipster Ale - Like the whole Hipster Ale range, a nice drinkable pale ale. Feral pHunking - Wonderful! Plenty of sour fruit, everything it promised to be! Gage Road A Cure for Mad Dog Bites and Other Maladies - Another scratching. Holgate Midnight Cowboy - Exactly what it said it was, a porter with sour cherries. Delicious! Illawarra's Resin Dog IPA - Nice bitter IPA, plenty of citrus and pine. Hop Dog's Brett the Bloody Orange - Brettanomyces everywhere in this one! Section 4 - This was such a good section! There were so many wonderful beers, Lizzie and I had everyone I think. The peoples choice winner of the festival came from this lot - La Sirene's Praline - I didn't think it was exceptional, I will look forward to giving it another chance if it comes out again. The Little Brewing Company's Breaking the Cardinal Rule was exceptional with heaps of passionfruit coming from the hops and the Tripel backdrop providing a fantastic base. Magic Rocks Circus of Sour - Barrel Aged - Very similar to the normal one, little evidence of barrel aging. But still a very nice beer! Mikkeller's Super Hopped American Dream - Pretty plain, not that hoppy. Definitely not Mikkeller's finest offering. Little Creatures SS Menno - Great red colour, sour but not amazing flavour. Morrison IPAison - Very good. More Saison than IPA. Fruity and dry. MoonDog Cold War Drip - Coffee and spices. Mornington R 'n' R Porter - Wonderful roasty Porter! Buy anything these guys make, I've never had a bad one! Monk The Dark Monk - So good, I think the best in this excellent section. A Belgian Black IPA. Section 5 - This was a pretty disappointing section. The only beer that stood out other than the ones mentioned below, was the Rocks Brewing Company The Pickpocket. Listed as an Apricot Wheat Beer, it was better than that, it was an Apricot Gose (sour wheat beer) and was particularly refreshing. Sierra Nevada Koalafornia Dreaming - Plenty of hops for a brown ale, very nice. Renaissance Export Pilsner - Bitter Pilsner! Beautiful! Nogne O Triple Wood Knot Brown - Awesome brown ale, huge ABV unnoticeable! Prancing Pony Frisky Pony - Really disappointing. Far too "bocky" for want of a better word. Riverside Brewing's Othello's Curse - Pretty standard black IPA, nothing really special about it. Section 6 - My suggestions in section 6 probably couldn't have been less helpful if I tried. I only named 4 initially and with 2 scratchings I was only left with 2 beer suggestions for you guys - at least both were awesome. I finished my paddle off with True South's Spicemarket - funnily enough it was spicy - Tuatara's Lo-Fi because I was getting pretty drunk and finally Young Henry's Mothers Ruin which was very Kvass-like in texture and somewhat in flavour. Sixpoint's 150% - SO BITTER! These guys never disappoint on the IPA front. Stillwater She'll be Right - Scratched! Temple Scarlet Super - Immensely sour! Exactly what I was hoping for. Thornbridge Valravn - Also Scratched! Was really looking forward to this one. There were many other beers that I managed to sample on the day. This on it's own was probably more than I needed to drink but coupled with going to the footy afterwards... and then to the Beer & Burger Lounge.... and then Alehouse Project. It's safe to say I was feeling quite ordinary the next day - and was probably a contributing factor in how long this write up has taken. Anyway - I wouldn't have had it any other way, GABS 2014 was the best yet!